Stand Up Awareness Week 2019 will take place from November 11th-15th, 2019. 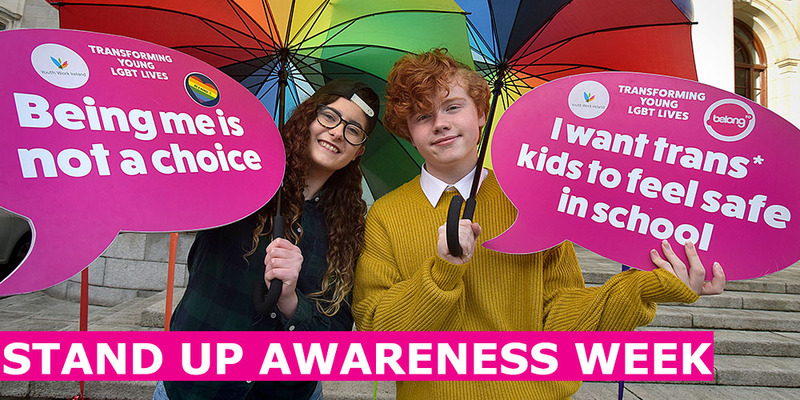 As part of Stand Up Week, we are inviting all second-level schools in Ireland to join us and take a stand against homophobic, biphobic and transphobic bullying. Stand Up week is an opportunity for schools to look at how they can make them safe and supportive places for LGBTI+ students. It is unacceptable that one in five young LGBTI+ people face bullying, and that 70% of young LGBTI+ students feel unsafe at school. At BeLonG To, we are working hard to educate and train the entire school community around supporting LGBTI+ young people. Download free resources including classroom activities, posters and more from 2018. Check out our selection of videos to educate your students around LGBTI+ issues.